Map of Kentucky and Tennessee with hand colored counties. Cities, towns, rivers, and railroads are all denoted. The purpose of these fact sheets is to help determine what sources are available for genealogical research about the people and places in each county. Although this is by no means an exhaustive list of all the possible places one might search, it does cover the major publications and microfilms available at the Tennessee State Library and Archives on the Tennessee counties. Among the sources not included in these lists are journals published by historical and genealogical societies, works on specific towns and cities within a county, and works with an emphasis other than genealogical or historical. 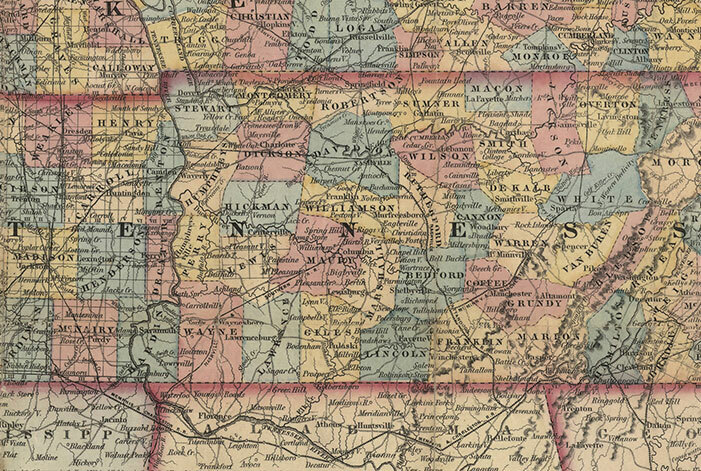 Although a work of this sort is sure to contain some errors and omissions, every effort has been made to include significant genealogical research tools dealing with Tennessee counties. New works are being published and added to the Library and Archives collections every year. Everyone interested in Tennessee history and genealogy is welcome at the Library and Archives. If your work results in a publication about Tennessee places or families, please provide us with a copy so that we may include it in a future edition of this publication.